Now this little thing is funky! 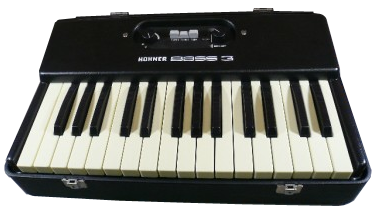 The Hohner Bass 3 was an all-analogue minisynth that produced three preset bass tones: Guitar, String and Tuba. Don’t let the names fool you: this isn’t orchestral, nor is it folky. It’s just raw and wild: a thunky twang gives the Guitar patch its bite, the String setting is all low tone for instant depth, and the Tuba is snarly with a ton of overtones to help it cut through a mix (or to be low-pass filtered to get even more scope). It all came packaged in a little black leatherette suitcase that you could close up to take on the road; and opened, it could be perched atop your Rhodes on stage so you could riff with your right and hold down the bass with your left. It was like opening up a neat little package and finding the Biggest Sound In The World was hiding inside. It was quirky, too. The two rotary controls on the panel were for volume (on the left) and a kind of weird envelope thing on the right. Twisting the right-hand control gave you either long sustained notes or short bass bops. And that, apart from preset selection, was it. Not a fat lot of versatility, to be honest. Naturally we’ve bolted some bits on to take care of that: our take on the Bass 3 has a full envelope control slotted in under the Preset buttons, and gives over the two rotary controls to Tone (which is a gentle low-pass filter) and Vibrato depth. There are further Rate and Delay controls for the Vibrato on the rear panel, which also has effects bays for Chorus and Phaser and Tube saturation to give the sounds a hotter edge. Rounding things off round the back are a mono / poly switch with portamento (glide) control, a stereo spread knob, and a full selection of amp cabinets through which to run your bass tones. These can really bring the Bass III to life. As well as adding in effects, we’ve also allowed you to do something that was impossible on the original instrument: to select all three Presets simultaneously. This gives you a really complex sound that takes the depth of the Guitar preset and adds a hefty dose of the Tuba’s overtones to it to create a real monster of a patch. 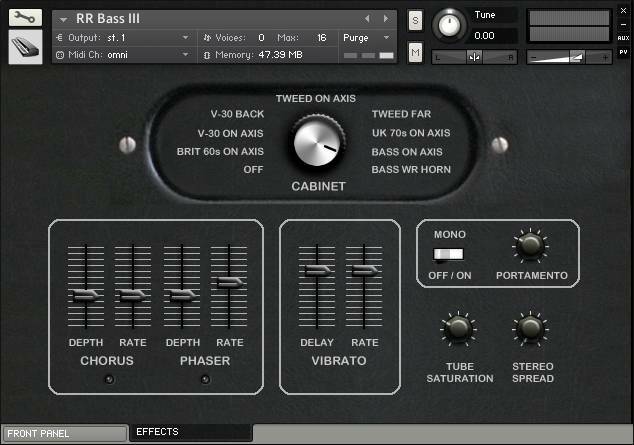 To get it, just select a Preset button and then click it again to “pop it out”: with all three buttons out, you’ll get our Bass III all-at-once patch. Our Bass 3 exhibits a fair amount of “analogue drift”, which we’ve partially cleaned up but partially left in place. 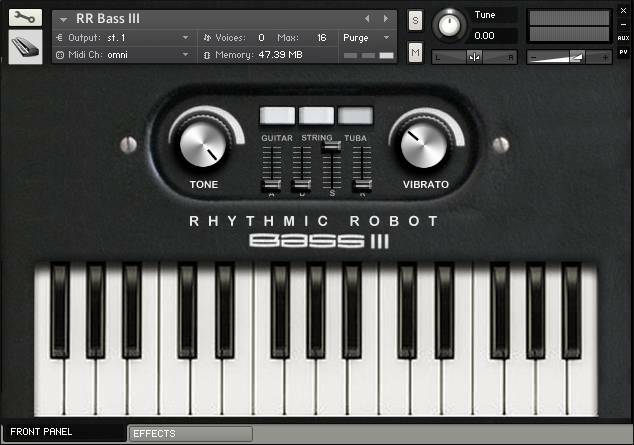 The result is a stable, properly tuned bass synth that nevertheless has enough warmth to its sounds that it’s going to add some serious analogue mojo to the underpinnings of your tracks. The Bass III doesn’t cover every bass sound under the sun: it just does three sounds (plus that hidden fourth) really really well. Plus it’s unusual and it’s analogue through and through. Bass III – time to go down! (All our Kontakt instruments require a full copy of Native Instruments Kontakt v4.2.3 or higher (including all versions of Kontakt 5). Kontakt Player is not supported: instruments will load, but will time out after 15 minutes. See the FAQ for further information.) You can read a bit more about the original Hohner Bass 3 here. Bass III made it to my final few instruments, holding my curiosity to the last. In play, it is pretty constrained in terms of the sounds it produces, and as another reviewer mentioned that Guitar sound is quite pokey. There may be a moment when that is just the sound you need. Just before this I was reading an interview with Jim Guthrie where he describes layering multiple instruments on top of each other, and I can see Bas II shining in that kind of a setup. (Again as another review mentions). It does, though, occupy an interesting sonic niche that is hard to place, between lo-fi / nearly chiptunes and a more analogue realm. Maybe that is due to its origins. I think what I feel about it is that I like the sounds it makes, and their character is charming: I just wish there were some more of them, or a way (like glitch) to dig deeper into their limited range. But I’m going to use this as a starting point for further modulation and see what it can do. As with all RR instruments, “more than meets the eye” is probably the answer. Who would have thunk a preset called “Tuba” would sound this cool? It seems a bit out of tune at times (? ), but not when layered with other sounds. The “Guitar” sound is a bit weird (popcornish, if you get my meaning), and it seems a bit weak on the higher notes, but I upped the volume on those samples, and it’s all good. The “String” sound is the same sample set as “Guitar”, only with a delayed sample start. Don’t know how that compares to the original instrument, but it works very well here. Seems like this will be my go-to-bass! Like Joe, above, I also own several Rhythmic Robot instruments, and I also find that this one is one of my most frequently used, and it does sound GREAT layered with any number of the other awesome instruments here. This is yet another one that will absolutely be useful in anyone’s arsenal, and again, like Joe mentioned, you CAN’T BEAT the prices of ANY instruments here at RR. I own a number of rhythmicrobot instruments, I like them all a lot. This one might be my favorite, but it’s a hard call. I love to layer this with other Kontakt instruments (especially SH Poly) to get some thick, textured basslines. Sometimes I use it by itself too. No complaints (about this or any other rhythmicrobot instrument,) and the price is nice.